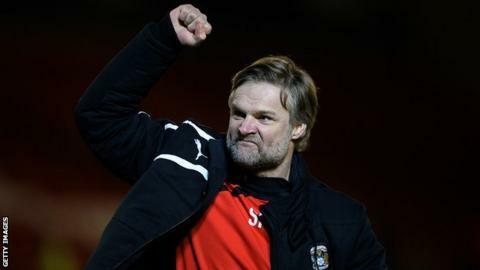 Coventry City boss Steven Pressley says they stand on the brink of something "unbelievable" as they close in on safety in League One. The Sky Blues, who started the season with a 10-point penalty, are one win away from securing their status. "I think for the players and the staff it would be an unbelievable achievement if we stayed up," Pressley told BBC Coventry & Warwickshire. "We're striving to do that and there's still work to do," he added. City's point in their goalless draw at Oldham took them to 50 in League One, four points clear of the relegation zone, with two games to go. If they can beat Wolves - already promoted as League One Champions - on Saturday they will guarantee their survival, barring any miraculous recovery from Carlisle, who are six points behind the Sky Blues and have a much worse goal difference despite having three matches left. Pressley has had to guide the club through a series of difficulties in a bid to prevent them dropping into the bottom tier of the Football League. Following their relegation from the Championship two years ago, Coventry have been hit by a worsening financial situation. The first of two 10-point penalties was handed down in March 2013 when the club's holding company was placed into administration. A second sanction was imposed at the start of the current season after that same part of the club went into liquidation. Added to that, the club were forced to leave their Ricoh Arena stadium following a row over unpaid rent and now play their 'home' games at Northampton Town's Sixfields Stadium. Pressley has also had to deal with transfer embargoes and the loss of star striker Leon Clarke to Wolves during the January window. "We have had to deal with a lot of things," Pressley said. "But I don't like to use them as excuses." The Sky Blues wiped out their deficit after six games and were threatening the League One play-offs at one stage after a run of nine wins and only four defeats in 19 matches. "I know everyone got excited when we had that terrific period but I said from the start if we survive it would take a lot to beat that," Pressley added. Read more on Why are Coventry City at their lowest ebb for nearly 50 years?